One look at upcoming WiiWare platformer Jett Rocket is all you need to see that it's not quite like anything else on the service. A 3D platformer with graphics to rival many full retail releases, it certainly has a lot of promise. We caught up with Shin'en Multimedia CEO Manfred Linzner to find out how large of a game they've created, how they push WiiWare to its limit and why the game has a dolphin with a helmet on in this exclusive interview. Nintendo Life: How long has Jett Rocket been in development? Linzner: It's been around 18 months in development, but the tools that are used to build the game are since half a decade in development. Art of Balance was quite the looker, and Jett Rocket appears to have some of the finest 3D visuals on WiiWare so far. How have you managed to maintain this high level of visual quality without breaking the 40 MB size limit? Our hardware background for 3D games is the Nintendo DS. On this system you have to use really every trick available to make a game look good. We developed nine games on the DS and I think that was the perfect education on how to achieve a lot with little resources. All of this experience got into our Wii development. Beside that, on the Wii you have a lot of design choices how to create graphic shaders. You can be very creative by exploiting certain side effects. Also we don't try to go for realism. We just try to make it look as beautiful as possible, while still being believable. Another trick we use is to generate textures in realtime to simulate effects that would otherwise not be possible on the Wii. All in all, it's quite a complicated process to bring all the tricks together but we think it's really worth it. Was there any part of the development stage that gave rise to unexpected problems, or did the game have a smooth ride from conception to end-product? There was no real deal breaker in the development, everything was quite smooth. However, two systems needed a lot of attention. That were the camera system and the character collision and movement. Already ten years ago in our 2D jump'n'run games those were critical parts and in 3D they even need much more attention. As Jett Rocket can freely explore the world there are unlimited camera and physics situations. We don't use invisible walls or scripted camera paths. So the game has to make its best guess what the player wants to do. Anyway, in the end we are very pleased that the character movement is super smooth and the camera system does a great job. 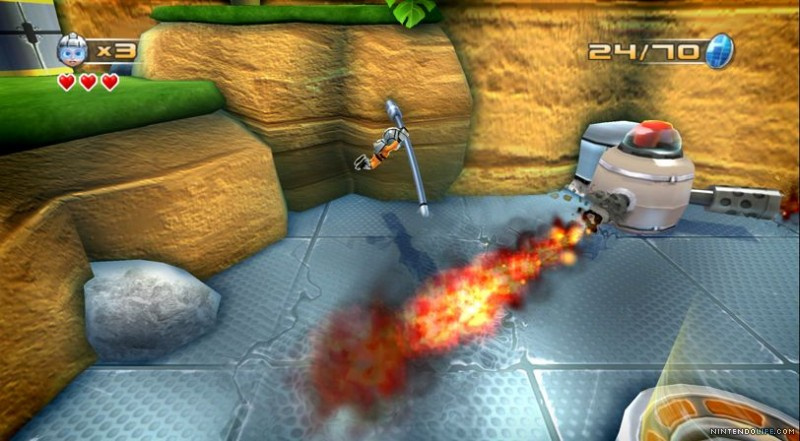 What made you choose WiiWare for your 3D action platformer as opposed to PSN, XBLA or even a Wii retail release? We did retail games for ten years. Now we want to explore the download market. It simply allows use to develop our games much faster because we don't need to look first for a publisher. 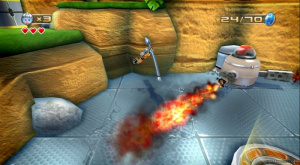 We have chosen WiiWare for Jett Rocket because we think such a game is really missing in the WiiWare library. There are a lot of puzzle and casual games, even some nice 2D action/adventure games, but no 3D exploration-based games. I think that is something that people are really looking forward to. We have seen so many linear and scripted 3D games over the last years. A game like Jett Rocket where you can go wherever you like and explore every corner is really refreshing. The art direction certainly helps it stand out among the WiiWare crowd. What were the biggest visual influences on the game? There weren't many influences from other games for the art itself. The different locations and characters have quite a unique look. Indeed there were influences in the lighting and special effects design (like reflections and refractions). For instance, we think games like Ratchet & Clank or Super Mario Galaxy did a very good job with how they light their levels. Tell us a little about the Power Plant Posse. What do they want with the planet Yoroppa and how does Jett Rocket get mixed up in all of this? How large is Yoroppa? Is it divided into "worlds" you can hop in between or is it more of a straight-up linear platformer? Yoroppa is divided into three climate zones. Later in the game you can freely hop between these zones. You can also backtrack anytime. While playing you unlock new levels in these zones. 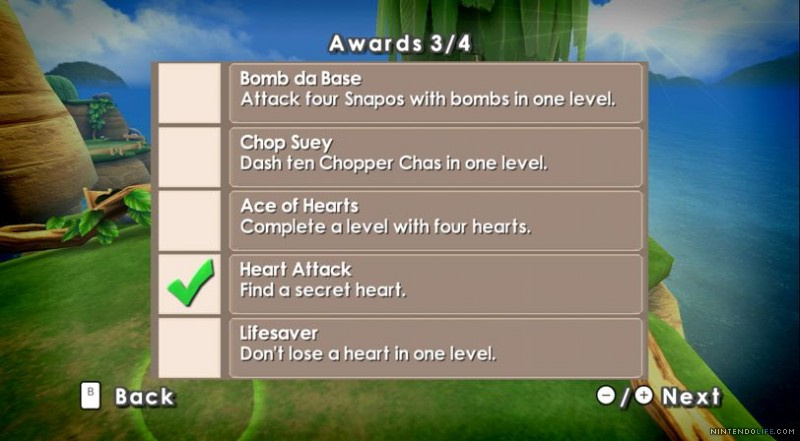 You can play every level after another or skip levels to progress faster. 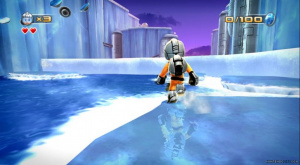 One of the screenshots shows a helmet-strapped dolphin. Is this a sidekick of sorts? Yeah, thats Rudolpho! Rudolpho is a playful fellow and an old friend of Jett's. He is always good at giving some hints or challenge Jett to a race. Jett Rocket is a pure single-player experience. Is MotionPlus used in any way? If not, did Shin'en ever consider it during development? Jett Rocket is a fast action game and you are always in full control. There are some motion controls but most moving is done via the Nunchuk and the Wiimote. MotionPlus was not added as there would have been no benefits. Are there any incentives for players to revisit the game once they've completed it for the first time? For example, unlockable characters or costumes, New Game+, and so forth? Yes, because we love unlockables in our games. For Jett Rocket we added two unlockable systems. First there is the gallery. There you can unlock characters and enemies you experienced in the game. You can then watch them freely with a 3D cam. Beside that we also have added 20 so-called "Awards." You can check those awards from the start screen or even while playing. Those awards are triggered by achieving special objectives. There are some easy, medium and some really hard goals! Its great fun to go for them. For some you need to play the levels in a different way than you're used to. What else do you have cooking over there at Shin'en? Currently we fully concentrate on Jett Rocket. However, later this year we have some more great stuff to uncover. For now I can only say our next game is in the racing genre. Again, something we haven't done before and we feel it's getting brilliant. When can we expect to see Jett Rocket hit the Shop? How much will it cost? We expect to have Jett Rocket out in the WiiWare shop very soon. As said before, better to count in weeks than in months. We want to keep the costs as low as possible to let really everyone experience the game. However, final costs are not decided yet as Nintendo also has its word on it. We will keep you posted. Nintendo Life thanks Manfred Linzner for his time. Trevor Chan contributed to this interview. This game looks insanely good. Great interview. Really looking forward to this game. 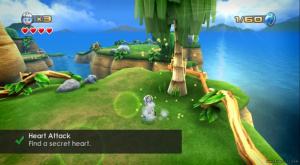 Looks even better than Flip's Twisted World from Majesco. I love that he game the release date and cost question a nice answer besides the typical "we can't tell you it's all up to Nintendo" response. Oooh these are the same developers as Art of Balance, now I'm really looking forward for this game. Art of balance really is my favourite Wiiware game at the moment, pity I'm already halfway through, would love some new levels (hint ). But anyway looking forward to this, I hope it will have the same amount of polish and creativity that made Art of Balance so great and from the looks it does certainly look like it has. Yeah this could be a good one. I still need to give Art of Balance a look too. Looking forward to this one. And good interview. Looks really good but the unlockables system actually sounds kinda boring for this. Still, looks like there is a lot of variety in the gameplay and I'm looking forward to its release. Awesome, can't wait to play this one. "Weeks not months"? I like the sound of that! Awesome interview. I'm buying this day one if I have the points. Also I'm reeeeeeeeeally intrigued about that racing game they mentioned. I really can't wait for that - I hope it'll be on WiiWare too! Game should be in the 1,000-1,500 Nintendo Points unless Nintendo decides to help them with some of the costs. Wow i cannot wait to get this, hope it comes to the EU and USA next month or June at the latest. My guess is May because Cave Story is still to come to the EU and that should come June. I agree with pretty much everyone; looks amazing. Looks cool. Judging by the gameplay videos I'd say it looks like a cross between Sonic (dash/ homing attack) and Mario Sunshine (Jet Pack vs. FLUDD). Look forward to seeing more. "Also we don't try to go for realism. We just try to make it look as beautiful as possible" - I frickin' LOVE that sentiment. I wish more developers thought that way. This is a day one purchase for me; everything Shin'En does grabs my attention ever since I got my hands on the incredibly impressive Iridion 2 for GBA. These guys are tech wizards on Nintendo consoles! Realism is what real life is for. Art of Balance was awesome. This LOOKS the part. Hope it plays well!